Next event up is the MTB National Marathon Championships out in Breckenridge, Colorado. 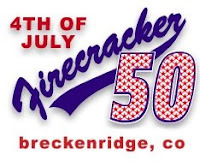 For the second year, the Firecracker 50 will host the Marathon Championships. Eric Tiffany and I are heading out together and will meet Good Ben for a fun weekend of riding/racing in Colorado. I am looking forward to a couple of days in the mountains. It has been about 6 years since my last visit to Colorado to ride. 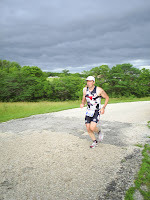 I am looking forward to the views and trails of the Firecracker 50. A group of eager riders including Damian Almanza, Jeff Arnaud and Randy Rasa of Kansas Cyclist assembled at the start ready to enjoy a day of gravel road riding. 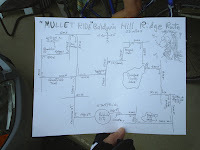 After some last minute supplies were gathered we headed off for our little 25 mile journey. This past week I've been very busy working on the upcoming (only 90 days left) cyclo-cross season. More specifically, the De Stad Cyclocross Van Kansas Series. Expect some great things out of this series this year. We have added two events from last years and have two new (maybe three) locations. We have some new sponsors for 08' and some new classes that I am sure will be a hit with the racers. First event of the series will be the Diamond Blackfan Cyclocross Challenge on 9/28/08. This event will benefit the Diamond Blackfan Anemia Foundation. My good friend and teammate Tige Lamb and I came up with this new event as a way to both raise money for the foundation and to raise awareness. We are working on getting a very cool location in Lenexa, Kansas for this opening round of the series. Special Thank You to Eric Tiffany for help with the artwork for the event. 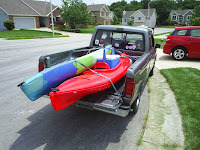 Carolynn and I loaded up the kayaks redneck style and headed to Smithville Lake this weekend. 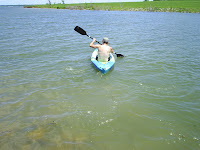 We had a great time paddling along the many miles of shoreline that SL has. Weather was near perfect on both days. Friday we met Damian and Anita for dinner the Legends at Village West. 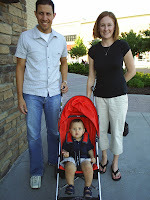 We settled on eating at Stix - I do love that Japanese cuisine.....That Aidan is sure growing fast. I have tried to talk Carolynn into trying to have another one ourselves, but she says she is way to old to have any more children. Quick results and some pics for now. Swim 1.2 miles (including long run to T1) 39 min. Total time including transitions on my watch was 5:40:25. My goal was to break 5:30, but that first lap of the run really hurt that chance. I had to walk several times during the first 6 miles. The next 3 were not that bad as my nausea went away some and my stomach started working again. I really pushed it the last 4 miles to try to get close to my goal time. The cooler weather from the approaching storm front helped with this. It turned out I ran a 1/2 marathon for nothing. They called the race during the run due to some storms coming in. I really don't understand why they did this. The weather was not bad at all. We ran the entire course, but our times are not counted? That is a bunch of crap if you ask me....In looking at the results only the top guys got their run counted - the ones that qualified for the 70.3 Championships to be held in November. The Lawrence Journal has a nice story about the event. 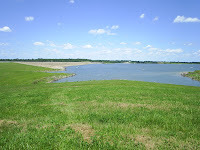 The time has come for the inaugural Ironman 70.3 Kansas. Carolynn and I headed out to Lawrence today for the Expo, packet pickup, body marking, bike drop off and final instructions. Tom Ziebart and crew did a very good job of bringing this event together. I remember old Tom from down in Florida. He used to work with Exclusive Sports Marketing which was the company that produced most of the triathlons in Florida when I lived there. 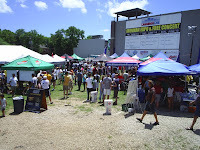 The Expo was packed with racers. I think everyone was like me and waited until the last minute to pick up their race packets and then head out to drop off their bikes. The Navy Seals were on hand and they had a little section where you could test yourself with a climbing net, pull up bar and sit ups. 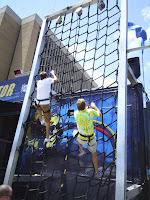 The record on the climbing net was 3.6 seconds. I wanted to see how close I could get, but I was afraid of injuring myself. A couple of young studs took a shot at it and one finished in about 5.5 seconds and the other got to the top at 6 seconds flat. 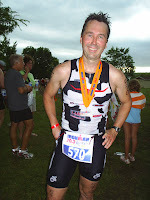 There was plenty of cool tri gear available at the expo. 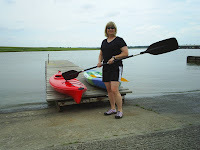 While in the Inside Out tent I was checking out their wet suits that were on sale. The sales guy asked me what size I wore and I said large or X-large depending on who made it. He said I was crazy and needed a medium (that was the largest size they had left) and referred me to the sizing chart. I assured him that my fat arse was not going to squeeze into a medium wet suit. Had he not seen the size of my arms??? After the Expo was the supposedly short drive out to Bloomington Beach. About 45 min later we finally arrive at the race site. Parking lot was already full so we had to park along the road. One thing I don't like about these big events are all the lines you have to wait in. It took about an hour just to get up to body marking. Once past body marking it was off to rack your bike and finally get to leave for home. My race number is 570 which put me in the far North West corner on the transition area which is very nice since it is easy to remember where to go after the bike leg. Carolynn and I had planned to go to my Manager's annual party tonight, but after standing in lines all day and dealing with the heat, I decided to stay at home and rest the best I could. That 3:45 a.m. alarm comes mighty early. 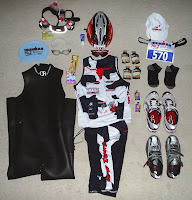 It takes a lot of gear to do a 1/2 Ironman triathlon. I laid most of my gear out to make sure I had everything. I am going to stick with the food I used in training which is primarily Accelerade gels and drink mix combined with CliffBars and Power Bar products. Wish me luck tomorrow with the 80+ temps and above average humidity! 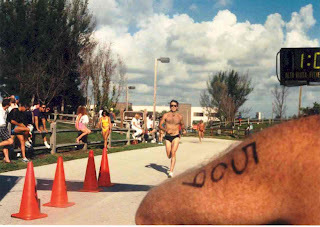 Back in 1989, Triathlon was getting very popular in Florida. 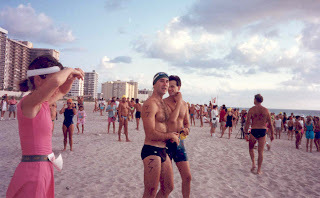 I saw this ad for the Miami Beach Triathlon, which was part of the Coca Cola Sprint Series. 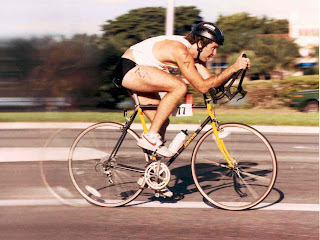 Heck, even Lance Armstrong was racing triathlons back then. Lance Armstrong, 18, worked less than an hour Saturday morning and collected enough money to make any working teen-ager envious. 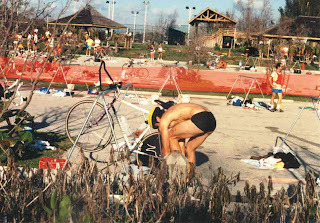 Armstrong, a resident of Plano, Texas, a suburb of Dallas, won the Coca-Cola National Championship Sprint Triathlon at the Waterways in North Miami Beach in 52 minutes 39 seconds. By winning the event, consisting of a half-mile swim, 14- mile bike ride and three-mile run, Armstrong won $2,000 plus a $300 bonus for being in first place after leaving the bike transition"
I did not know much about bikes back then (not to say that I do now) and ended up buying a state of the art Jamis road bike for $295.00. It was too small for me and weighted about 30 lbs, but I thought I was going to set the triathlon world on fire especially with my cool Profile one- piece triathlon bars. Needless to say I got my arse spanked in my first event. I finished around 415th place overall and outside the top 30 in the Male 20-24 division. 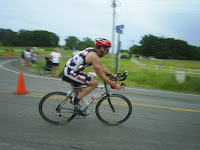 I fell in love with Triathlon and gave up on MX. Heck, I even shaved my legs :-).... I started to ride my bike everywhere. 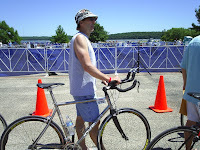 Especially when I got a new Dave Scott Ironman Centerion Expert bike. 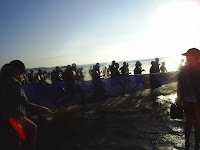 It fit me great and was actually a very good bike....the above picture is from the very popular Loggerhead Triathlon in Jupiter Beach, Florida. I improved greatly in a little over a year. 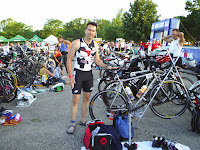 I was setting some very strong bike splits (Top 5 out of over 600+ racers) and was always one of the first athletes to get back to the transition area. If only I could have been born with the ability to run. Still did o.k. 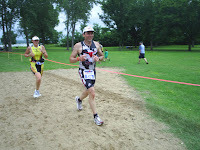 overall and got up on the podium at most of my races despite having a slow run. 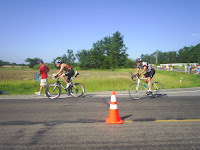 Carolynn and I headed down to watch some of our friends in the Hospital Hill 1/2 Marathon race today. 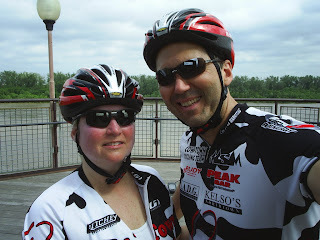 It was our first ride on the tandem in quite awhile and we really enjoyed ourselves. Headwind to Crown Center sucked, but it made for a fast ride home. 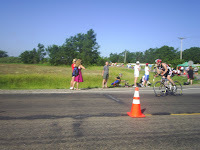 The overall male winner Matthew Chesang was flying and finished the hilly course in 1:06:28. The female winner Genoveva Kigen was not far behind in 1:17:52. 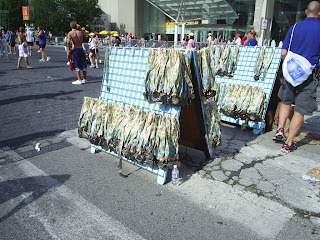 It looks like a couple of thousand people were racing and they had awards for them all. With gas prices like they are and the cost of living going up sometimes donating money to special causes takes a back seat. But now is the time these fundraisers really need our help. Roger is participating in the annual Penguin Paddle this Friday. 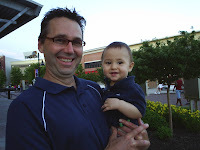 His goal is to raise $1,200.00 to help with finding a cure for Arthritis. So far he has $850.00 so he is almost there. Tige and Vicki have done very well raising money for the Diamond Blackfan Anemia Foundation. As I wrote in an earlier post, Vickie is running the Hospital Hill 1/2 Marathon in support of their foundation. With the help of Kristine a few news stories have run over the past weeks. The local community has really helped out so far donating over $6,000.00 to help the DBA. Speaking of the DBA and fundraising, look for a new cyclocross race to start off the cyclocross racing season this fall.